What is Carbon Monoxide? How is it produced in the home? Carbon Monoxide is an odorless, toxic gas. It is produced by the incomplete combustion of solid, liquid, and gaseous fuels. Appliances fueled with gas, oil, kerosene, or wood may produce CO. If such appliances are not installed, maintained, or used properly, the accumulation of CO can rise to dangerous levels. Breathing CO causes symptoms such as headaches, dizziness, and weakness in healthy people. Co also causes sleepiness, nausea, vomiting, confusion, and disorientation. At very high levels, it can cause loss of consciousness and death. Why are these symptoms particularly dangerous? Because CO effects often are not recognized. CO is odorless and some of the symptoms are similar to the Flu and other common illnesses. Are some people more affected by exposure than others? CO exposures especially affect unborn babies, infants, and people with anemia or history of heart disease. Dangerous levels of CO can be prevented. Here are some tips to get you started! A qualified service technician should check your home's central and room heating appliances annually including the thermostat controls and automatic safety devices. Chimneys and flutes should be checked for blockages, corrosion, and loose connections. Individual appliances should be serviced regularly. Kerosene and space heaters should be cleaned and inspected to insure proper operation. Appliances should be vented properly, according to manufacturer's instructions. Make sure the room where an unvented gas or kerosene space heater is used is well ventilated. Doors leading to another room should be open to insure proper ventilation. Never use an unvented gas or kerosene space heater overnight, or in a room where you sleep. 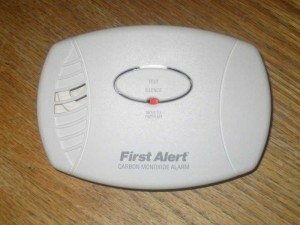 There are many different manufacturers and types of carbon monoxide detectors available. Choose one that suits your purpose. Make sure you place the detectors according to the instructions and check them regularly. Shown below are a few different types that are available. There are simple detectors that beep when CO reaches a set level, and there are also combination CO and smoke detectors.